The 2010 challenge, “Breakaway,” (FRC 2010 Game Animation) provided an opportunity for students to investigate several designs in drive, ball possession, and kicking in order to participate in advantageous aspects of the game. The field was divided into three zones by 2 13-inch high constructed bumps which spanned the width of the field. In the middle of each bump was a tunnel, under which short robots could travel to move from zone to zone, and over which loomed a tower. On each end teams could score soccer balls in or defend two low goals, as well as hang from the towers to gain additional points. Due to scoring strategy, we decided not to make hanging a paramount design goal. We did, however, aim to have an agile robot which could easily traverse bumps and fit under the tunnel, and prototyped countless mechanisms for ball possession and projection. By the BAE unveiling event our robot was climbing bumps and kicking with considerable force. Only after the event did we include a vacuum with which to attain balls. 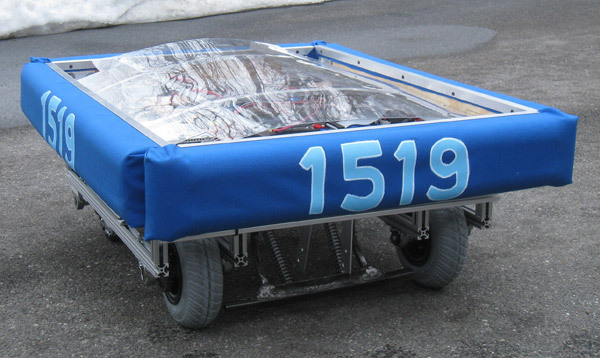 Our robot before GSR featured four-wheel drive which allowed for pushing, maneuverability, and speed, as well as an adjustable-power kicker capable of scoring from all zones. We arrived at the Granite State Regional tournament with several adjustments to make, all of which contributed to a satisfactory performance. We played both offensive and defensive positions and our autonomous program consistently advanced three balls through two zones, often scoring. For some of the competition the robot even managed to move five balls, greatly exceeding the number of balls most teams moved in the autonomous period. At the end of the first competition day we were seeded 18th, having won four out of six rounds. Saturday we finished the qualifying rounds seeded 7th, winning 2 out of our last 4 rounds. Allied with The Force Team (1073) and The PVC Pirates (1058), we took a defensive position and went on to play the top seed alliance of 1922, 78, and 134 in the final rounds. These matches were very suspenseful – our alliance won the first match, the second was a tie, and the top seed alliance won the third. In the very last match we won 11 to 2. Along with finishing champions in the robotics competition, we were happily surprised to receive the Rockwell Innovation in Control award and for one of our seniors to receive one of the two regional Dean’s List awards. Of course, much revision took place post-GSR in preparation for the upcoming North Carolina Regional and Championships in Atlanta. Students and coaches finished the Chairman’s video for submission at our 2nd regional, and using the practice robot at home, revised our ball possession mechanisms. We added a ball shepherding mechanism in time for NCR, which helped us to get balls from the walls and corners. This year NASA sponsored us by paying for our registration at a new regional! We were happy to compete at a second regional and eager to get in more practice before Championships, so we drove down to North Carolina, packed to help the many rookie teams attending as well as furnish our own pit. On Friday we won five out of six matches, seeding 1st. At the end of the qualification matches Saturday we were seeded 2nd. Several students could not attend the North Carolina Regional, resulting in a stretch for scouts, but we did choose a strategic alliance for the elimination rounds. Allied with teamRed Alert (1741) and the AIDTEC Trail Blazers (1772), we went on to play 48, 1086, and 1902 in the final rounds. Although we won the first round, the opposing alliance was victorious, winning the following two rounds. We ended up winning the Delphi Engineering Excellence Award and 2nd place in the robot competition, and were overjoyed for one of our coaches to win the Woodie Flowers award. At the end of the competition we discovered serious damage to our suction mounting-plate and battery box, as well as several other issues and damaged parts. We had a long list of things to do before we left for Atlanta! play on Archimedes, we pre-scouted the division and found ourselves in the hardest division. We prepared our strategy and attitudes for tough competition, and despite our low expectations God blessed us richly! On Thursday we won all three of our qualification rounds, finishing the day as 3rd seed. On Friday we finished in 9th, winning four out of five qualification rounds. On Saturday we won our last two qualification rounds and were seeded 5th. We then captained the 5th seed alliance, selecting the NC Gears (1918) and More Martians (70) as allies. We competed against the Beach Bots’ alliance in 3 quarterfinal matches, playing a close tie before losing two rounds to them. We watched the Archimedes Division Champions on Einstein, and applauded them for their strategy and skill competing against the high scoring Curie Champions. Our division’s alliance kept a close score, however, they did not make it to finals. In the end the Newton Champions claimed the victory on Einstein.